Old Mac's help Sonny Get Back on His Feet! 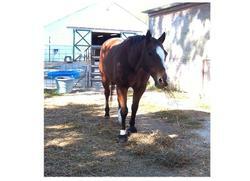 We recently received a touching testimonial from Marty Garrison about her horse Sonny. After his trusty farrier joined the service and set off to Iraq poor Sonny went through some serious waves of hoof issues. He was completely lame until owner Marty learned about Pete Ramey and Gene Ovnicek barefoot trimming techniques just by doing a Google Search! Through her internet surfing she learned about EasyCare and our variety of hoof boots. Sonny's boot of choice are Old Mac's! 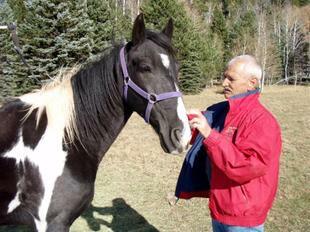 Marty even found a Hoof Care Practitioner by using our Practitioner Search! Sonny is now 25 years old and trotting around with some very happy hooves. Read the full story here! Remember... You can share your testimonial with us too. You will receive a cool EasyCare Hoof Pick when you submit your story with a picture! Share your Hoof Boot Testimonial for a Chance to Win a Pair of Easyboot Epics! Congrats to Terry Hobin who won a pair of Easyboot Epics just for telling us how EasyCare hoof boots saved his Standardbred Quest's life. Click here to read about what Terry has to say. As a reminder, we read through all the testimonials that come in each month and select a monthly winner. So if you would like a chance to win a free pair of Easyboot Epics be sure to send us your story. We'd love to hear from you!!! Easyboot Epics Help a Mare Ride Comfortably Again! We've received some touching stories about what EasyCare Hoofboots have done to help improve the life of horses in need. Read below to see how Easyboot Epics helped Camille Estrade and her horse Jardineria ride comfortably again. 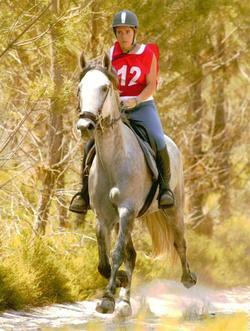 In November 2005, veterinarian found grey mare Jardineira being "navicular". I took the decision of taking off the iron shoes, instead of changing into orthopedic iron shoes: going barefoot, let her the possibility of curing her herself. We went through a hard winter of transition and recovery (yes, recovery, slow but true! 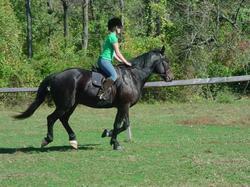 ), where any trail ride would find her painful and sensitive: her feet were not strong enough. I bought four Easyboot Epics, and we went riding comfortably on any ground, activating blood circulation by long rides allowed by the boots... Today, one year later, the grey mare is NOT navicular anymore, saved, competing barefoot in hunter and eventing.... Competing endurance still, with the Epics. Back to the wonderful, happy, inventive, crazy partner she used to be "before." Want to read more? Trot on over to our Testimonials page to read other great stories that happy customers have shared with us. Would you like to share your own story with us? Click on the Submit Your Story link on our testimonial page or email us to submit your own testimonial. We'd love to hear from you. Tell Us Your Story and receive a Free Grip Shirt! We often get emails from happy customers sharing a story about what EasyCare boots have done for their horse. Do you have a story you would like to share with us? 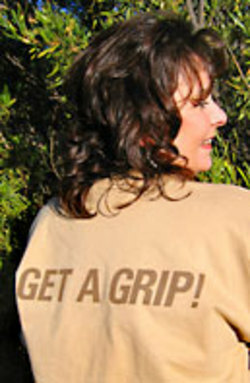 We're going to give away "Get a Grip" t-shirts (sizes while supplies last) to the next 25 testimonials that we receive. Photos must be included with your testimonial. Please be sure to include your email address so that we may contact you. Click here to submit your story. We'd love to hear from you! Want to hear what other people have to say? Check out our testimonials to page to read up on other success stories.